A country’s electoral system influences its party political structure in two obvious and related ways. On the one hand, the electoral system has an important bearing on the number of parties able to attain parliamentary representation; on the other, any electoral system tends to favour the interests of some parties — generally those involved in its elaboration — at the expense of others. In Spain, the current electoral system remains in essence that which was developed for the first post-Franco elections of June 1977, which had the specific purpose of electing a constituent assembly. 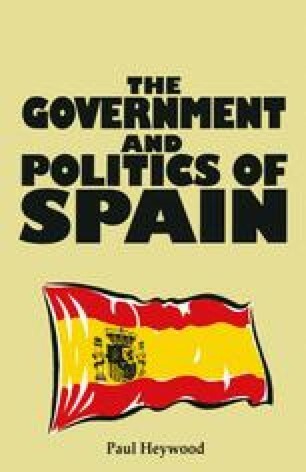 Thus, many of its features reflect the exigencies of the earliest stages of Spain’s transition to democracy, most notably the negotiations between Adolfo Suórez and other key protagonists between September 1976 and March 1977 (Esteban and Lápez Guerra, 1982: 55–6; Gunther, Sani and Shabad, 1986: 43–53).